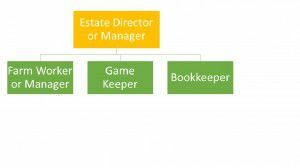 Although an estate director or estate manager’s duties may vary hugely depending on the size of the estate, in general the role requires the management of every aspect of the establishment. On larger estates, an estate director may be responsible for all the estate staff, accounting and bookkeeping, whilst on a smaller scale, the job might call for a more hands-on approach. In many cases, where the owners live away, the estate manager would reside on the estate. Typically in charge of an estate in excess of 5,000 acres the estate manager or director will have overall responsibility for its smooth running. They will also be responsible for the profitability of the estate. Eden Private Staff is experienced in conducting searches for estate directors and estate managers. We can find candidates for roles ranging from a 200 acre Home Counties estate to much larger commercial estates comprising thousands of acres, with turnovers of millions of pounds. We are able to recruit for estates all over the world. Overseeing and contributing to the smooth running, general upkeep and maintenance of the estate and its properties. Overseeing agricultural activities, including all livestock and arable operations. Liaising with external bodies such as Defra, RPA and AVLA, if based in the UK. Dealing with external advisors such as agronomists, vets, and farriers. Managing the land and using it to its best potential. Overseeing sporting activities – such as a shoot. Administration and management of budgets, event planning and management. The knowledge, experience and skills of an estate manager or director will vary depending on the size of the estates they have previously managed. Many will have experience in managing multiple residences, often abroad, giving them valuable international experience and some will come from a commercial farming background. To perform such an important role, the right candidate will usually hold a formal qualification or have extensive experience. Most qualifications will be in land management or farming, taken at a variety of universities and colleges, of which the most well known is the Royal Agricultural College, Cirencester..
A slight variation on the estate director role is that of facilities director. Typically this will involve responsibility for a diverse range of buildings and land which will be part of a large organisation or body, such as a school, hospital, office block or university. They will be responsible for the staff maintaining these premises, such as gardeners, construction or building maintenance staff. They would form part of the senior management team of an organization, generally report to the managing director, finance director or a CEO. For further information please contact the Eden Private Staff Team on 020 7471 6000.